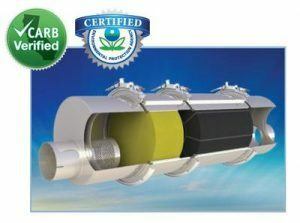 A Diesel Particulate Filter (DPF) removes approximately 85% of diesel particulate matter (DPM) or soot, from the exhaust of diesel engines. It may remove up to 100% of soot, depending on the filter and other equipment. During operation, diesel engines produce a variety of particulate matter (PM) due to incomplete fuel combustion. The composition of these particles varies widely – based on engine type, age, and the emissions specifications that the engine was designed to meet. The emitted particles in diesel exhaust can penetrate deep into the lungs – posing serious health risks including aggravated asthma, lung damage and other respiratory problems. Diesel-powered vehicles which are equipped with a DPF will emit no visible emissions from the exhaust pipe and are far less harmful to the environment as well as the general health of those in the vicinity of the running vehicle. DPFs can also employ catalyst systems to passively oxidize accumulated soot and actively regenerate using external energy sources to initiate thermal oxidation. California began regulating diesel engine emissions in 1987. Since then, progressively tighter standards have been introduced for both on-road and off-road diesel engines.